Welcome to Friendship Tea, a blog about the daily happenings in the life of Linda, a tea enthusiast, who enjoys travel and trip planning, and is passionate about family, friends, life in Kentucky, and all things TEA. WHAT IS A CREAM TEA? Scones, Clotted Cream and Jam served with a Pot of Tea. Including fresh Rodda's Cornish Clotted Cream. Notice the thick, golden crust on the top of the cream. Rodda's is only available in the UK. "Come to my Table and Share with me Warm Gingerbread Cookies and Cinnamon Tea"
The delightful sign on the table was a gift from a blog reader a couple of years ago. in person, through Facebook and email. by, and especially all who make comments. Just FYI, Austin loves Transylvania University in Lexington, KY. Content and images on this blog may not be used or distributed without permission of the author, Linda Jennings. "Come and share a pot of tea. My home is warm and my friendship's free." "You don't choose your family. They are God's gift to you, as you are to them." 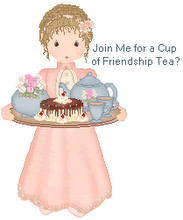 "Friendship Tea Recipe" ~~ 1/2 cup instant tea, 1 cup sweetened lemonade mix, 1 cup Tang, 1 tsp. ground cinnamon, 1/2 tsp. ground cloves, Combine all ingredients and mix well. Store in a an airtight container. To serve, put 2 to 3 tsp. mix in a mug and stir in 1 cup of boiling water. Adjust amount of mix to taste. Enjoy! If you are exhausted, it will calm you."